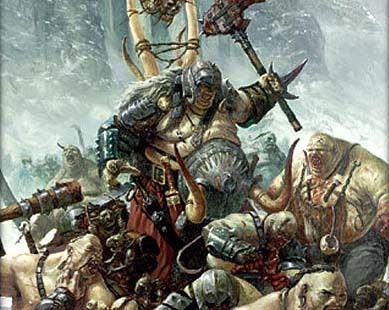 From the Warp: Storm Wardens and Ogre Kingdoms? Storm Wardens and Ogre Kingdoms? What's going on here, I thought Storm Wardens were 40k and not Fantasy? Turns out Steve from Indiana won the Storm Wardens weekly give away last week and picked up a Battleforce of his choice. Ogre Kingdoms it is. A special thanks goes out to my local game store, Game Vault for providing the prize support and helping us with our goal of raising money for Doctors Without Borders. If you haven't donated, you need to get to it, we're coming up on the end of our project and we'll be drawing for the finished army in the coming weeks. If you've already donated, thank you. And since there is no limit to the number of times you can donate, you just might want to consider donating again to increase your odds of winning a weekly prize and the complete army at the end. Steve does have a great-looking IG army. Perhaps the Ogres are soon to be Ogryns? I'm planning starting an Ogre Kingdoms Army, but I also figure that if I ever want to some Ogryn, they'll get converted from Ogre models, so having those on hand would allow that converison.